Mini, BMW-owned maker of small cars for the fashionable, has taken the drive for better fuel economy as seriously as any other maker. It has a programme in place called Minimalism, which is broadly equivalent to its parent maker’s better-known EfficientDynamics scheme. Minimalism employs a range of miserly techniques including automatic engine stop-start, a shift indicator to encourage the driver to select the most economical gear, and so-called regenerative battery charging, in which the alternator does its work during engine braking and is decoupled at other times to reduce unnecessary loads. At the Geneva Motor show this year the company announced a new extra-frugal model designed to reduce consumption still further without shedding the core values that define the modern Mini, namely urge, agility, and a premium feel. 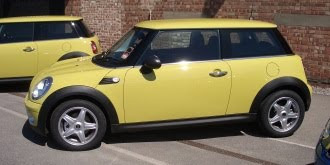 This model – the Mini One Minimalist – has recently gone on sale in the UK. The Minimalist is based on the mid-range Mini One model, which sits above the basic and slower Mini First, and beneath the faster Cooper and Cooper S models. Like the Mini One, the Mini Minimalist employs a 1.6-litre engine developing a relatively modest 98bhp, good for a 10.5-second sprint to 62mph and 116mph flat out. The combined cycle economy figures are 55.4mpg and 119g/km, meaning the Minimalist ducks into Band C on the tax-disc cough-up chart and thus qualifies for nought pounds of showroom tax, and just £30 when it comes to buying your next perforated paper circle. 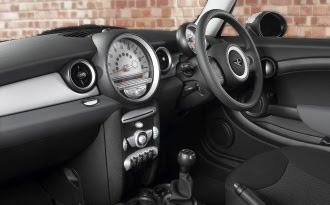 The standard Mini One offers identical performance but slightly worse consumption, at 52.5mpg and 127g/km. It also ducks showroom tax but costs £90 a year to tax thereafter. You will be able to spot a Minimalist next to its ordinary siblings without close inspection of tax discs, however. 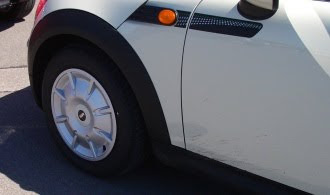 The car is sold wearing a set of wind-cheating plastic wheel covers that are as conspicuous as linen spats and about as up to the minute. You really can’t miss them and equally you can’t delete them – the wheel covers are integral to the official CO2 rating and can’t be replaced when it comes to gussying up with optional add-ons. What happens in the after-market is another matter of course. Beneath the plastic covers are 15-inch steel rims, shod with 175/65 low-rolling-resistance rubber. Other ways to spot the Minimalist include a white-slatted, chrome-ringed grille, subtle green door decals, white door-mirror shrouds and, presumably, the hair shirt worn by the driver. The Minimalist costs £330 more than the Mini One, starting at £12,950, and it’s hard to see where the extra cash has gone. As is currently common with eco-label specials, less costs more. It’s not all bad, though. When we drove the Minimalist back to back with a regular One sitting on pretty 16-inch alloys, the Minimalist offered by far the better ride. Run-flat tyres on the alloy rims probably didn’t help, but the regular One was noticeably more bouncy and skittish on rough B-roads, unexpectedly making it easier to maintain speed in the better-planted, more economical car. The Minimalist does lose out in raw grip, of course, with the tyres starting to audibly protest at much more modest loads. The stop-start function operated flawlessly during our 30-mile test drive, cutting the engine smoothly when stationary and in neutral, and restarting with a brief whir of starter motor the moment we prodded the clutch. As with all modern Minis, the interior is cramped but beautifully put together, with lovely materials and hopeless ergonomics. We are glad that the multifunction display, set into the neat little tachometer, can be coerced into showing digital speed. Doing so removes the need to peer across at the passenger side of the dinner-plate speedo in the middle of the dash. Pedals are slightly offset towards the door but offer bags of feel, the six-speed gearbox is snickety and clean, and the gear-shift reminder is helpful when wanted and easily ignored when not. All-round visibility is superb – it’s a real joy to drive a car with such well-placed and unobtrusive pillars, courtesy of a close and upright screen. You do pay a penalty in wind roar at speed, but we think added safety at junctions is worth a bit of ear-bashing. Our verdict? The Minimalist succeeds in its goal of adding a little extra green virtue to the Mini without ruining its unique character. If you can live with the wheels, it’s a characterful little car that will no doubt command the usual rock-solid Mini residuals. If you absolutely have to have alloys, the ordinary One is still a relatively green and responsible little car and you can have one with shiny 15-inch spoked wheels for about the same price as the Minimalist. On the other hand, both are in fact less economical than a diesel-engined Mini. The Cooper D is slightly quicker but scores a wholesome 104g/km and 72.4mpg on the combined test. But it does cost a not insignificant £2,210 more than the Minimalist, before the inevitable extras. As ever, choosing the right car depends entirely on your priorities – and the depth of your pockets.